The traditional Cuban highball made of white rum, mint and lime, gets a sunny modern makeover. A mango represents the best of summer – sweet and juicy, with sunny yellow flesh, bursting with flavor that transports you to the tropics even as you’re looking at Puget Sound. It’s also a superfood, packed with vitamins A, C, B6, antioxidants and dietary fiber. You can add mango to summer salads, coleslaw, salsa and smoothies for an instant dose of color, sweetness and tropical flair, but it truly shines in your favorite cocktail. The mojito, a traditional Cuban highball made of white rum, mint and lime, gets a sunny modern makeover with mango purée. It’s smooth, refreshing and a bright addition to the table for summer soirées. 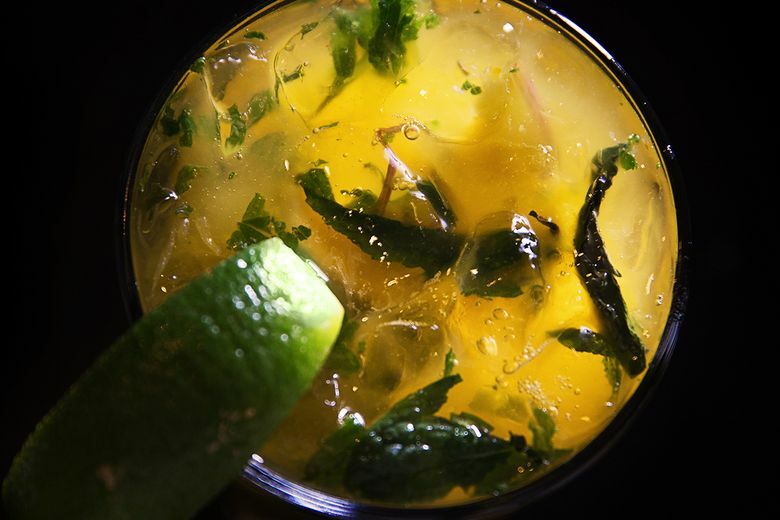 Wild Ginger serves about 260 mango mojitos each month at its downtown location. 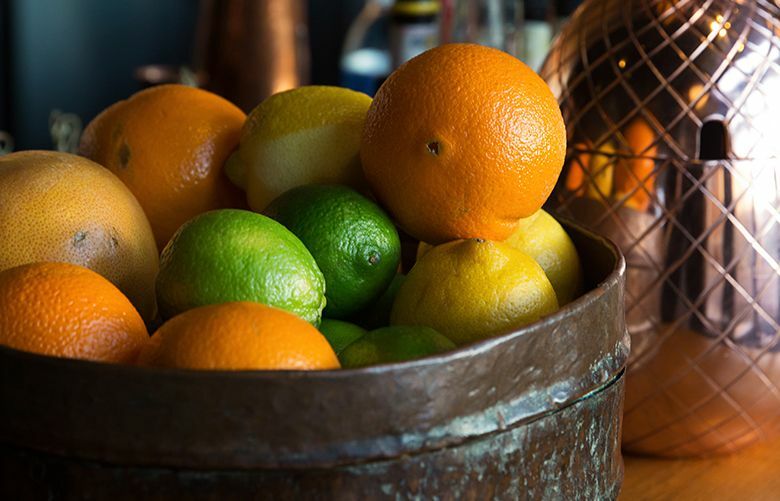 The restaurant’s co-owner, Ann Yoder, created this summery spin on the popular rum drink more than 20 years ago, and it remains a signature best-seller year-round. Sweet, fruity and fun, the cocktail brings home Wild Ginger’s Southeast Asian flair, and pairs well with spicy curries and a simple chicken satay. Squeeze 8 fresh lime wedges in pitcher. Muddle to release juice, then add ice and mint leaves. Lightly muddle mint. Add remaining ingredients top with club soda. Stir. Serve in pint glasses garnished with the remaining lime wedges, and enjoy! Wild Ginger makes its own mango purée for fresh cocktails on the spot. It’s easy to do at home, too. Choose a fresh, ripe mango of any type. Mexican mangoes are available year-round. Look for red skin (not green), which indicates ripeness. Feel it – it should give a little when you touch it. Peel the mango. Slice the fruit up against the oblong pit. Dice the fruit and blend with 1 to 1.5 cups of water in a blender until smooth with no chunks, like the consistency of a milkshake. Taste for sweetness. A ripe, sweet mango requires no added sugar. A less ripe mango will benefit from 1-2 tbsp. of sugar, blended until smooth. Homemade mango purée will make four to six cocktails, depending on the size of the mango. Home cooks can save time by buying mango pulp in a can, available year-round at Indian grocery stores. Paul Dekker, General Manager of Wild Ginger Bellevue, recommends Kesar Mango Pulp from The Souk in Pike Place Market. Cans are 16 oz., which makes 12-15 mojitos. Dekker shares his advice on how to create quality craft cocktails at home. “Start with the best ingredients and you really can’t go wrong.” For the mojito, Wild Ginger uses Angostura rum from Barbados. But keep it simple. “Make something that you like and that you’re familiar with. If you’re not familiar, stick to what you like, and you’ll be successful,” Dekker says. Wild Ginger Asian Restaurant & Satay Bar specializes in Pacific Rim cuisine, with locations in downtown Seattle, Bellevue, and soon, South Lake Union.